As most of you know, I'm a huge fan of a workable and reliable backup strategy. One of the most important parts of that strategy involves taking a backup offsite with you. If your backup is in your office and a natural disaster occurs, it will do you no good. Of course all of us make mistakes on occasion and even though we know we're supposed to take that backup home with us, sometimes they get left behind. The ioSafe can help in that regard. 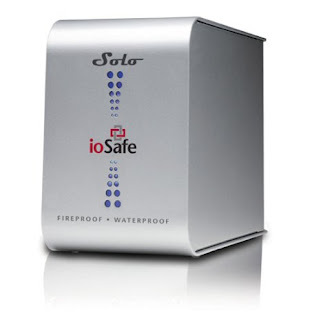 This external hard drive is fireproof up to 1500 degrees and waterproof up to a 10 foot depth for 3 days. It is available in 500GB, 1 TB, and 1.5 TB sizes. This handy USB 2.0 portable drive should be taken offsite with you, but if you forget it's nice to know the odds of it surviving a disaster are much better than other pieces of gear. It's also affordable with the 1.5 TB edition selling for only $299. More info is available on the company website. Being in the medical profession, it seems like much less of a security risk by backing up on site (fireproof hard drive) than by taking the backup tape home where it could be lost, broken or stolen. Seems like there have been too many news headlines of this happening to important data. I think if you can bolt down this hard drive and hide it in a closet or ceiling then you've got a simple plan for HIPAA compliance and data recovery.